Information and training for new parents about pregnancy and parenting. Parkdale High Park Ontario Early Years Centre also brings together in one location, information about children’s services and programs in the community. 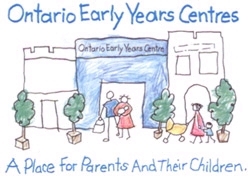 If you have questions about your child’s development, or want to know how to get information or services for your child aged 0-6 in Parkdale High Park, please visit your Ontario Early Years Centre at 2918 Dundas St. W., Toronto ON M6P 1Y8, or call us at 416-762-3700. There are no fees to participate in the Ontario Early Years Program at Parkdale/High Park.For more information on Ontario Early Years Centres please clickhere. For more information on this program please contact the Ontario Early Years Centre directly at 416-762-3700.